around the clock, so you save time and react faster. 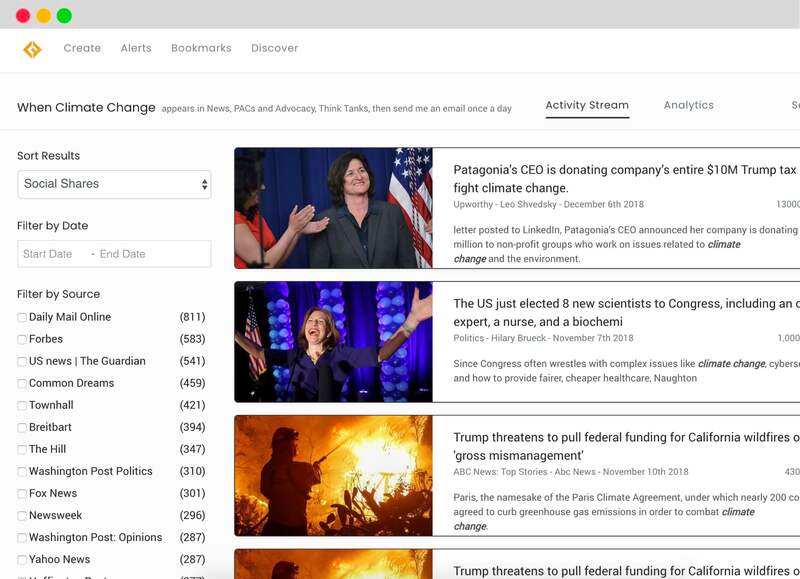 "CivicFeed uses AI to sift through, identify and update you with the most relevant content." Pick a person, keyword, or organization, choose the sources you care about and select where and when you'd like to get alerts. Never miss a thing. We visit hundreds of thousands of websites every single day for you and let you know when your organization, your competitors, people, or a specific phrase is mentioned. Creating a new alert is a three step process. Smart algorithms tailor your search and you can use booleans to tweak results even more. Limit results to the sources you care about, find articles from a specific date range or location or sort by social media shares. Measure changes in media narrative over time, how often a topic is mentioned on social and the people talking about your issue. Discover the people behind the stories. Determine the topics that journalists write about, their influence, and recent stories. Use powerful analytics to break your story into the channels that matter and measure success. Understand how people and organizations adopt certain phrases or how news stories are getting shared on social media. "It’s been so easy to be aware any time our agency or one of our issues is mentioned."